The TRANSPOSE jack shifts the outputs by semitones, fifths or octaves and the PORTAMENTO jack sets the glide time by CV. The 1983 always stores the notes played in a legato sequence in a buffer, and the WINDOW jack allows for selecting which of these notes appear at the outputs. When the UPDATE jack is used, it forces the outputs to update only when a trigger is detected. This way a MIDI keyboard can be used as an input interface for harmonies and note sets that are further creatively processed with triggers and CV in the modular environment. 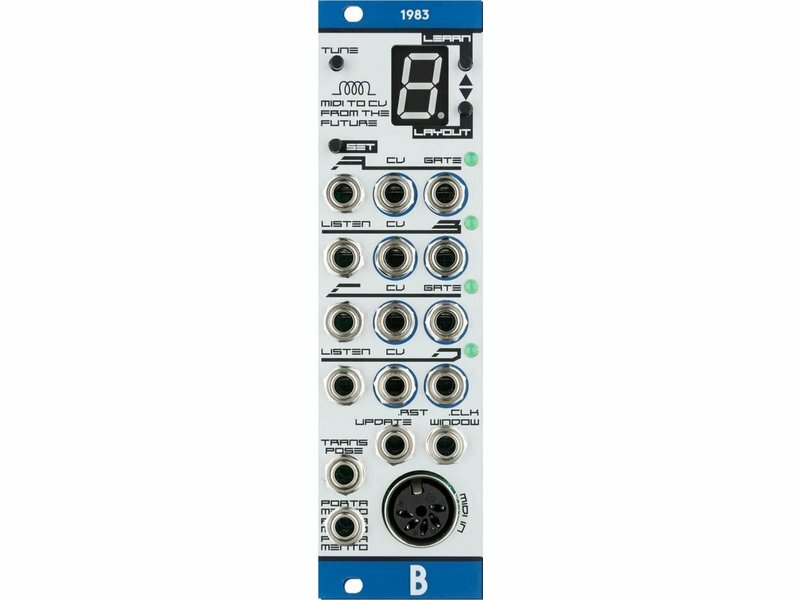 The quad Quantizer mode on the 1983 converts input voltages into semitones of scales defined either by playing notes into the MIDI input or by the buttons in the menu. 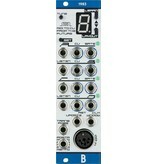 This allows the 1983 to be used tuning correction device (quantizer) without the necessity or using MIDI. MICRO TUNING Default tuning is A = 440Hz in equal temperament, but alternative tuning systems are possible with the µTune feature. It allows working with custom detuning of each semitone in the octave and therefore to work with just intonation and alternative tuning systems.